It seems President Jacob Zuma might not pull his usual giggles when he watches this one, as it promises to shake his world. 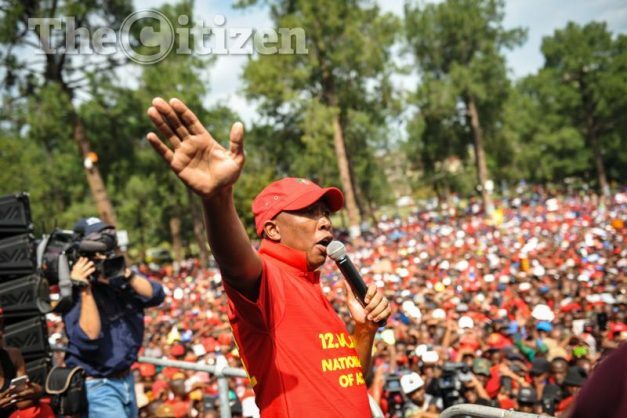 More than 310 million households worldwide will be treated to a documentary about Economic Freedom Fighters (EFF) leader Julius Malema titled Julius vs The ANC on April 26th. The 48-minute-long documentary, set to be broadcast on Al Jazeera, will chronicle the controversial rise of Malema, a star in the ANC until 2012, when he was expelled after a bitter fallout with President Jacob Zuma. It will follow his journey in 2013 when he founded his own political party, the EFF, now the third largest in South Africa. Also featured in Rehad Desai’s documentary will be the police killing of 34 striking mineworkers at Marikana in 2012, the Nkandla-related booing of Zuma at Nelson Mandela’s funeral, the violent brawls in parliament at state of the nation addresses, the Constitutional Court’s finding that Zuma “failed to uphold, defend and respect the constitution,” and the #FeesMustFall student protests. Julius vs the ANC provides the context for South Africa’s shifting voting patterns, which saw the ruling ANC lose three more big cities during last year’s municipal elections. Desai has described Julius vs the ANC as the second film in a trilogy about South African politics that began with Miners Shot Down, a documentary that saw him bag an International Emmy.